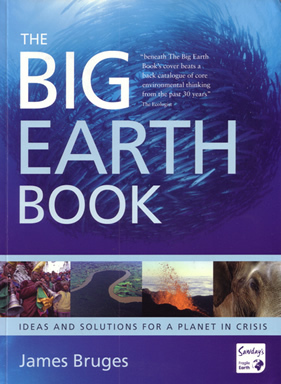 The Big Earth Book is not just another book that just gives us scientific facts on the growing climate crisis. Its scope is a lot broader than that. It is, at times, a deeply philosophical book based on the author’s Gandhian perspective. James Bruges gets straight to the point, declaring that “humanity is facing dangers it has never faced before”. He believes that fundamental changes are essential in our attitudes to nature and society, including the need for radical political and economic action. There is much to admire, such as the wonderfully bright and informative photographs, and ideas boxes, which are spread throughout the book to add emphasis to the issues being covered. However, what is most admirable is the way Bruges exposes the failures of current social relationships. He rightly condemns Margaret Thatcher’s zeal for free trade at any cost, which, along with corporate globalisation, has led to the largest income gap between rich and poor in the UK since 1880. The free market means that half of the world currently lives at or below the poverty line. Bruges points to the failure of globalised free trade in developing countries. Kenya, which was largely self-sufficient in food during the 1970’s, now has to import food as the result of the cynical “aid system”, turning most of its productive land over to growing food for exports to pay off its debt. Similarly, Brazil uses three-quarters of its national income just to pay the interest on its debt - not actually paying back any of the original loan - by exporting timber, beef and soya. All are extracted, reared or grown from or on land cleared from the Amazon forest. While succinctly setting out the evidence relating to the developing climate crisis, for most of the book Bruges criticises what he describes as the ideas of the “dominant west”, although he avoids naming it for what it is – global capitalism. Why he seems unable to make this connection I am not sure, as he recognises that the G8 leaders “cannot be trusted with world affairs”. He also describes the decision at Kyoto to consider the atmosphere the property of the ‘developed world’, so they could trade in carbon for profit, as simply a new form of colonialism. The book is sprinkled with suggestions on ways that society could be changed. You may agree with some and others you might be sceptical about, but at least there is a search for alternatives to market solutions. The Adivasis tribe of Gudalur, southern India, don’t have a concept of private ownership and consider the idea of ‘Fair Trade’, i.e. asking people to pay more for their tea, to be a form of exploitation. So instead they have set up co-operative trade links to ship their tea, from their community-based tea growing project, directly to whole food shops in Europe – a trade that benefits both producers and consumers. Also at a time when banks and the financial system are in meltdown, as the result of their fantasy finance exploits, Bruges gives us an example of the not-for-profit Swedish members owned cooperative JAK Bank. Members are only able to obtain interest free loans by creating ‘saving points’ based on the amount of money saved, in interest-free accounts, and also how long it has been saved with the bank. So, although he recognises the failures of global capitalism and promotes alternative approaches to the way we could live and trade, the weakness in the author’s approach is revealed towards the end. He says that “fundamentalist market economics... is a remarkably silly idea” [emphasis added]. At no point does he stress that fundamentalist market economics is the inevitable consequence of capitalism; capitalism can operate no other way. Unless we recognise the need to move beyond the social and political limitations of capitalism many of the alternative ideas put forward in this book could be strangled and the “paradigm shift, from ownership to relationship” is doomed to failure. There is a real need for all those who see the need for fundamental changes to the way society is organised to debate these issues fully, so common ground can be agreed and solutions evolved. This process will require revolutionary changes, such as those outlined in the recent book Unmasking the State. What is required are new democratic forms for the not-for-profit, co-operative democratic society needed to deal with the ecological crisis facing us all.